Bamboo Yoga Clothes: Embracing The Athleisure Trend. Athleisure is one of those words that hasn’t been around for long, but has an obvious meaning. It covers a broad category of clothing from scuba dresses with go-faster stripes to bamboo yoga leggings. I’m a regular gym-goer and I have some very nice kit that is both stylish and functional. But that’s where it stays. In the gym. wouldn’t wear it at any other time. I’m not a pyjama type of girl either. I don’t have anything to lounge in that I’d be prepared to answer the door in or nip to the shops in, (not that I’d nip to the shops in pyjamas but you know what I mean). So I was very keen to try some organic yoga clothing when Asquith, a British independent ethical brand gave me the opportunity. 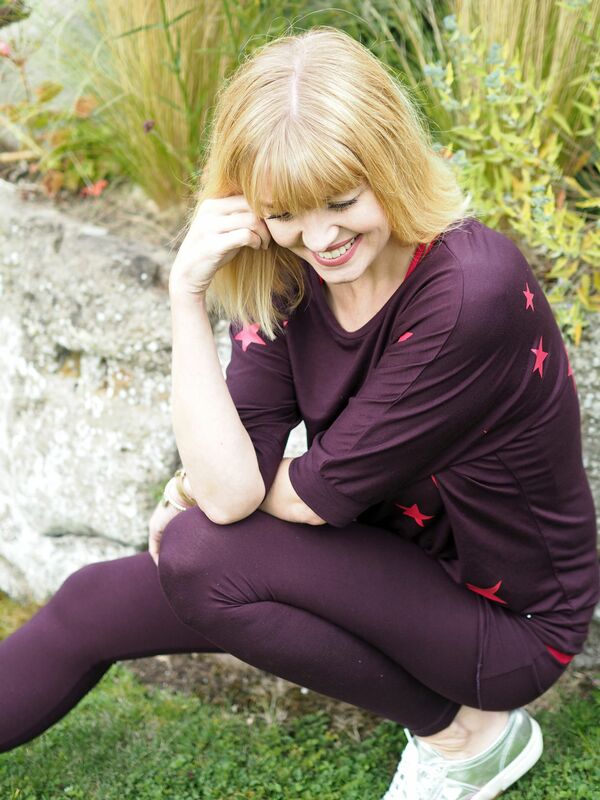 I chose a pair of bamboo yoga leggings, a cami and a batwing top with a gorgeous star print. The Smooth You Leggings, in aubergine, (£55) are full-length and have an integrated skirt that covers the bottom. It’s a thoughtful design detail that makes a big difference to the overall look. The leggings are made from breathable bamboo. They have excellent stretch properties and I guarantee that they don’t go baggy at the knees or bottom. I wore them to drive home from Bank House Hotel (which I wrote about in the previous blogpost; aka #codgate). The journey was stop start the whole way home and it took almost five hours. I was thoroughly fed up by the time we got home but the leggings were pristine. I’m so glad I was wearing something so comfortable. 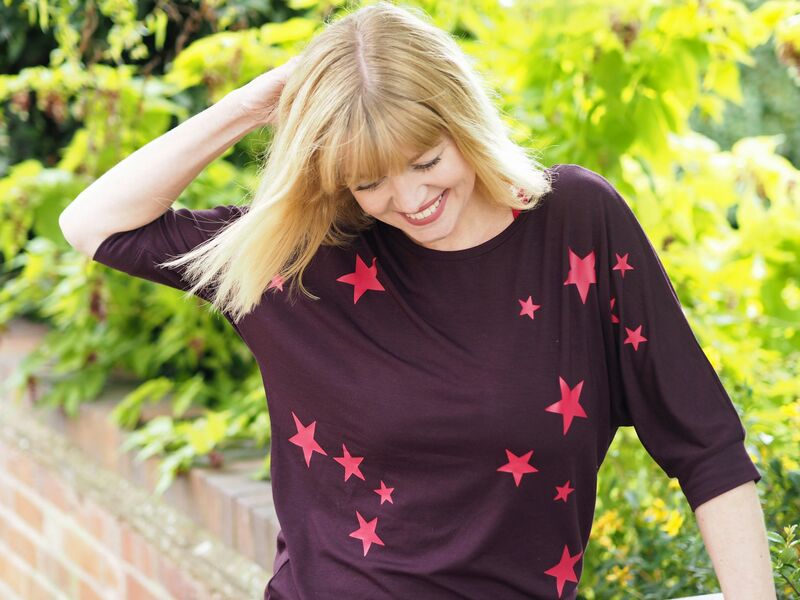 The Be Grace batwing top, in aubergine and crimson, (£59), is one of the softest, most comfortable things I’ve ever worn. It’s made from a beautifully drapey bamboo fabric and is fitted at the hip so it stays in place. It comes in a grey and a blue colourway too. I love all three. The grey one in particular would look fab with a pair of skinny jeans and heels for an evening look. I chose the crimson Conquer Cami, (£52) to wear underneath. The crossover straps at the back caught my eye but it is functionally excellent too. It is a longer length which is both flattering across the tummy and means it doesn’t ride up. It has a medium-support built in bra which supported me adequately and would certainly be good enough for light exercise or yoga. (For reference, I’m a D-cup). These bamboo yoga clothes are super soft, super stylish and sustainable. Asquith also does a range of maternity yoga clothes and yoga accessories. I am very impressed with this brand; the ethos and the products are excellent. This is style with substance. This post is sponsored by Asquith but as always, my opinions are 100% honest and the content is all mine. I want to thank Ian for taking the photographs and to thank you for supporting the brands that support my blog. Beautiful outfit for yoga! I should be better dressed when working out! I’m now going to slink off and find my yoga mat. What an inspiring piece and such fabulous photos. I’ve recently started Pilates classes and I’ve been on the lookout for alternatives to my usual gym kit so I’m going to try Asquith – their website is great with the detailed videos. I love the fact that you showcase lesser known British brands selling quality products – it’s one of the many reasons I love reading your blog. Thank you! I love the looks! such a great shade, this outfits pieces are really looking so good. this are best outfits choice at yoga time..